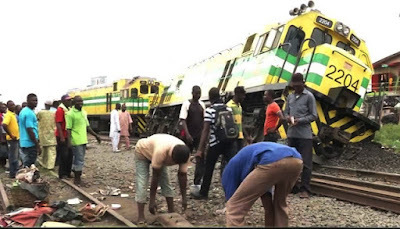 The death of two adult male has just been confirmed by the Lagos State Emergency Management Agency, LASEMA, after a train hit a commercial bus. This incident occured in Pen-Cinema, Agege, Lagos state. Mr Adesina Tiamiyu, the General Manager of LASEMA, said in a statement on Friday in Lagos, that the agency received a distress call at 8.57a.m via the emergency toll free number. Tiamiyu said that the call was pertaining to a passenger train that hit a parked commercial bus. He said that the accident forced three of the hanging passengers to fall off the moving train. ”Unfortunately, two adult male lost their lives and were taken to the mortuary by the State Environmental Health Monitoring Unit, SHEMU. ”One adult sustained injuries and was transferred to Lagos State University Teaching Hospital (LASUTH),” the LASEMA boss said. He said that other agencies that responded at the scene of the accident include the Nigeria Police force (Railway Police Division), the Lagos State Ambulance Service (LASAMBUS) and the Lagos State Traffic Management Authority (LASTMA). Others are the Civil Defence Corps, Rapid Response Squad (RRS), LASG Task force, LASG Fire Service (AGEGE Division), Nigerian Armed Forces (NAF) OPS, MESA and the Vehicle Inspection Office (VIO). 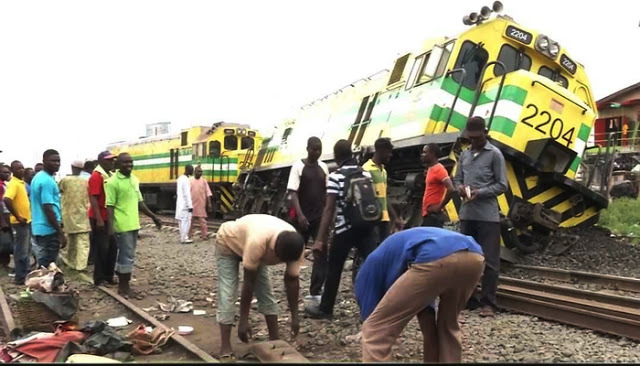 Tiamiyu urged passengers to abide by the overall safety measures put in place before boarding a train.